My workshop is a single garage which is partly attached to the side of the house, the front up and over door is sealed off and insulated and the roof is also insulated, usable space is 20 feet long by 8 feet wide. Heating is provided by a radiator which is connected to the house central heating system which keeps it at at least 40F and also dry. I also have a fan heater which I put on for half an hour before starting work to raise the temp to something more comfy, when needed, after that the machinery keeps it warm. Below is a view of the workshop looking towards the rear with the entry door on the right and the freezer on the left. 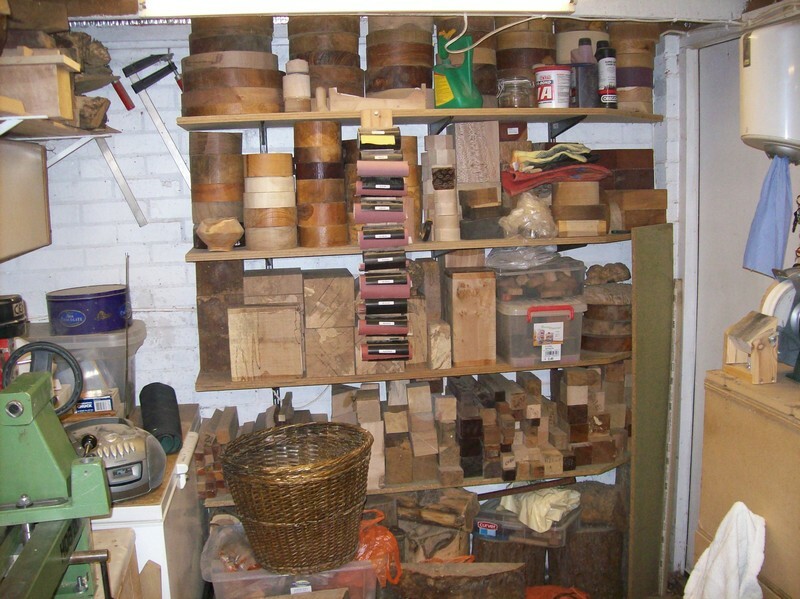 The racking holds my stock of dried prepared blanks ready for turning, some are brought in others I have prepared myself. The freezer takes up a bit of space but comes in handy for lumps of wood that have bugs but are too big for the microwave, providing SWMBO doesn’t find out. . 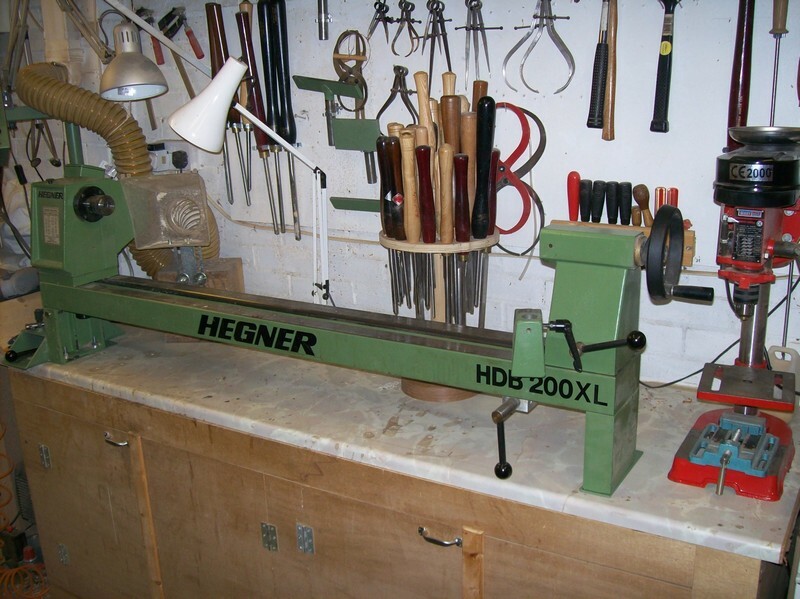 The picture below shows my main lathe mounted on a sturdy and heavy bench, the cupboards in the bench are used to store power tools and turning bits and bobs when not in use. On the wall behind the bench I have mounted a 3/4” thick board and use it for some of my larger turning tools calipers etc. Additional storage for smaller tools that I use a lot can be seen in the middle of the picture. Other tools that I don’t use a lot are stored in the cupboards underneath along with some more larger tools that I don’t have room for on the wall. Not that I have many toys, whoops I mean tools. On the left hand side of the picture by the head stock you can see the collector scoop for dust, this works but is a bit small so I need to make a bigger one, another item on my to do list. On the right of the bench is my pillar drill it is a bit small both in size and power and not very accurate, one day I will buy a good one. 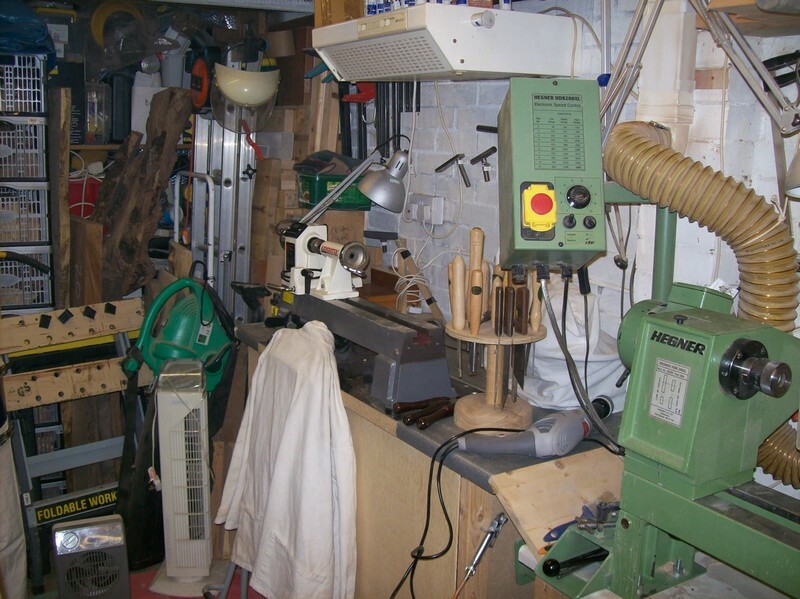 Continuing down the right hand side you can see my small lathe which is an Axminster AWVSL which I use for things such as pens, Key rings etc. The cupboard under it houses the microwave and further wood storage. Above the lathe is an old cooker hood which I use as an ambient air filter. Also stored on this bench under a white cloth is my scroll saw. At the end of the workshop in front of the shelves is storage for boards etc. waiting to be cut up, as well as an assortment of other stuff.